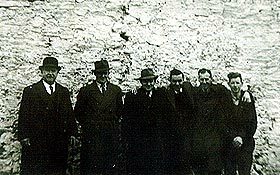 Falconers have been providing a first rate chauffeur service to Ireland for generations. 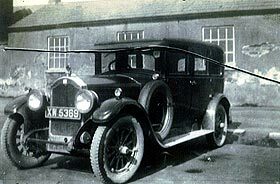 Ireland’s first motor car was owned by Sir Ernest Gough of Waterford, it should come as no surprise then that Ireland’s first garage was in Waterford – Kellys of Catherine St.
James Falconer Senior 4/2/1910 – 17/4/1991 began servicing his time as a motor mechanic in 1924 – Impatient to drive rather than service these new inventions, he talked his Mother Mary Eliza to guarantee a bank loan for a Willys (later Jeep) ‘Overlander’ – a 12 seat open charabanc. 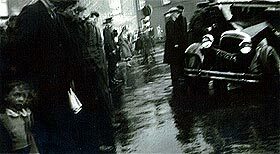 This started Ireland’s oldest family run, family operated Limousine business. Now into its third generation Falconers is one of the most varied wedding fleets in the 32 counties. This includes unique Rolls Royces from 1933 onwards, together with Hummers, Stretch Limousines and Chryslers. Falconers have always and continue to operate a 24/7 365 days a year professional service. View our services page to see our now diverse range on services including Historical tours around Ireland and Golf tours.